Margaret Stuyvesant Rutherfurd White made quite an impact on her expatriate acquaintances in Europe. Novelist Edith Wharton recalled her striking beauty: "It is hard to picture nowadays the shell-like transparence, the luminous red-and-white, of those young cheeks untouched by paint or powder, in which the blood came and went like the lights of an aurora." Although she appears rather serious in this formal portrait, Mrs. White—called "Daisy"—was known to be quite lively in her social pursuits. As the author Henry James wrote from London in 1888: "The happy American here, beyond all others, is Mrs. Henry White." Commissioned 1883 by the sitter and her husband, Mr. [1850-1927] and Mrs. [1854-1916] Henry White, Paris; by inheritance 1927 to their son, John Campbell White [1884-1967], New York; gift 1949 to the Corcoran Gallery of Art, Washington; acquired 2014 by the National Gallery of Art. The One Hundred and Sixteenth Exhibition of the Royal Academy of Arts, London, 5 May - 4 August 1884, no. 788, as Mrs. H. White. Société internationale de peinture: quatrième année, Galerie Georges Petit, Paris, 15 May - June 1885. Exposition universelle de 1889, Palais du Champ de Marts, Galerie des Beaux-Arts, Paris, 5 May - 5 November 1889, checklist no. 263 (Etats-Unis), as Mrs. W.
Sixth Exhibition: Oil Paintings by Contemporary American Artists, Corcoran Gallery of Art, Washington, 17 December 1916 - 21 January 1917, no. 216, as Mrs. Henry White. Retrospective Exhibition of Important Works of John Singer Sargent, Grand Central Art Galleries, New York, 23 February - 22 March 1924, no. 41, as Portrait of Mrs. Henry White - née Margaret Stuyvesant Rutherford (sic). Portraits of Yesterday and Today: A Loan Exhibition Showing Distinguished Personalities of the New York Scene in the Golden Nineties, and a Representative Exhibition of Portraits by Contemporary Artists, Grand Central Art Galleries, New York, 4-6 May 1943, no. 42. De Gustibus...An Exhibition of American Paintings Illustrating a Century of Taste and Criticism, Corcoran Gallery of Art, Washington, 9 January - 20 February 1949, no. 26, as Mrs. Henry White. Progress of a Collection, Corcoran Gallery of Art, Washington, 7 January - 18 March 1951, unpublished checklist. The Private World of John Singer Sargent, Corcoran Gallery of Art, Washington; Cleveland Museum of Art; Worcester Art Museum; Munson-Williams-Proctor Arts Institute, Utica, 1964-1965, no. 24. John Singer Sargent and the Edwardian Age, Leeds Art Galleries, England; National Portrait Gallery, London; The Detroit Institute of Arts, 1979, no. 12. American Portraiture in the Grand Manner, 1720-1920, Los Angeles Country Museum of Art, National Portrait Gallery, Washington, 1981-1982, no. 52. John Singer Sargent at the Corcoran, Corcoran Museum of Art, Washington, 1983, unpublished checklist. Edith Wharton's World: Portraits of People and Places, National Portrait Gallery, Washington, 26 September 1997 - 25 January 1998, unnumbered checklist, as Margaret Rutherford White. The Forty-Fifth Biennial: The Corcoran Collects, 1907-1998, Corcoran Gallery of Art, Washington, 17 July - 29 September 1998, unnumbered catalogue. The Gilded Cage: Views of American Women, 1873-1921, Corcoran Gallery of Art, Washington, 13 July - 27 August 2002, unpublished checklist. The Impressionist Tradition in America, Corcoran Gallery of Art, Washington, 18 July 2003 - 18 October 2004, unpublished checklist. Encouraging American Genius: Master Paintings from the Corcoran Gallery of Art, Corcoran Gallery of Art, Washington; Museum of Fine Arts, Houston; Parrish Art Museum, Southampton, New York; Mint Museum of Art, Charlotte; John and Mable Ringling Museum of Art, Sarasota, 2005-2007, checklist no. 51 (shown only in Washington). Americans in Paris 1860-1900, National Gallery, London; Museum of Fine Arts, Boston; Metropolitan Museum of Art, New York, 2006-2007, no. 32. John Singer Sargent in the Corcoran Collection, Corcoran Gallery of Art, Washington, 11 July 2009 - 3 January 2010, unpublished checklist. Ormond, Richard, and Elaine Kilmurray. John Singer Sargent: The Early Portraits. The Complete Paintings, Volume I. New Haven and London, 1998: no. 1883, repro. Simpson, Marc. 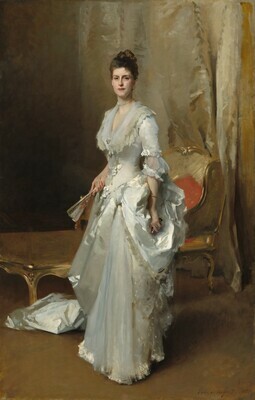 "John Singer Sargent, "Margaret Stuyvesant Rutherfurd White (Mrs. Henry White)." In Corcoran Gallery of Art : American Paintings to 1945. Edited by Sarah Cash. Washington, 2011: 162-163, 172, 271-272, repro. Saigne, Guy. Léon Bonnat: Le portraitiste de la IIIe République. Catalogue raisonné des portraits. Paris, 2017: 140.